And I've gotten my traditional THIRD email letting me know that I still haven't registered my children for school. You know, because registration was a day ago. And I still haven't done it. And do you want to know WHY I haven't done it? It's because I'm protesting the fact that I have to register my children each and every year. I can't just stop by and be like, "So yeah, that whole going to school here every day of their life thing is just going to keep on happening." I have to spend hours of my life signing the same forms stating that I understand that cheating and throwing snowballs with rocks inside of them are considered "naughty" and may or may not get them expelled. I've pretty much got the concept after the first 5 times I signed the forms. AND... I have to sign them individually for each child. Because clearly, I cannot be trusted to understand that the snowball rule applies to both my son AND my daughter. Truthfully, I'm actually not protesting anything. I just don't want to do it. I'd rather make cookies. And eat ice cream. And do "research" on Pinterest. I even did a load of laundry today instead of registration. I'm not proud of that. 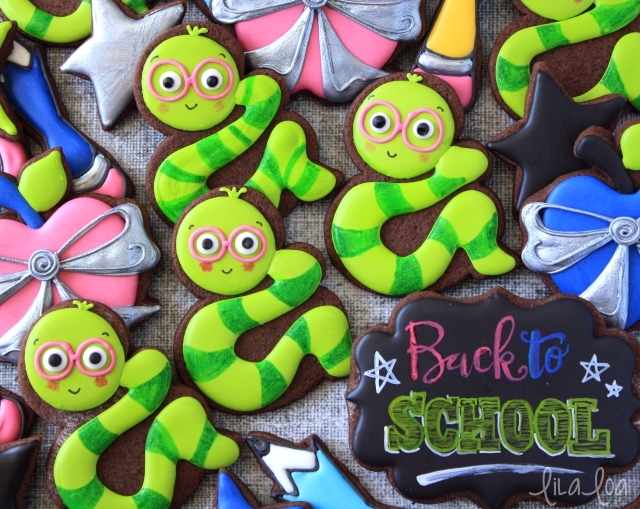 I am, however, totally in love with this year's back-to-school cookies! I can't wait to show them all to you! Let's start with these bookworm cookies. 1. Trace a small round cutter with a food color marker on the face area of the cookie. Grab some medium consistency green icing and a #3 tip to outline and fill the circle for the head. Let it dry for 15 minutes. 2. Use the same icing to pipe the body of the bookworm. I found that it worked best when I piped the under side of the body before the top side. But I might just be weird. Try it both ways and see which one you like best. 3. Pipe two white dots for eyes and then immediately add two black dots. Alternatively...you could add pre-made eyeballs in step one. Change the tip on the green icing to a #1.5 tip and add some little fuzzies on top of the head. It's not really hair, because bookworms don't have hair...but it's not an antennae either. I don't really know what it is, except that it's adorable. Let the cookie dry for 3-4 hours. 4. Grab a green food color marker and give your little guy some stripes. You could also use icing. Add some pink cheeks with a pink food color marker. Using a #1.5 tip and pink icing, pipe a circle around each eye and a little connecting line for glasses. Add a smile and eyebrows with black icing or a black food color marker. 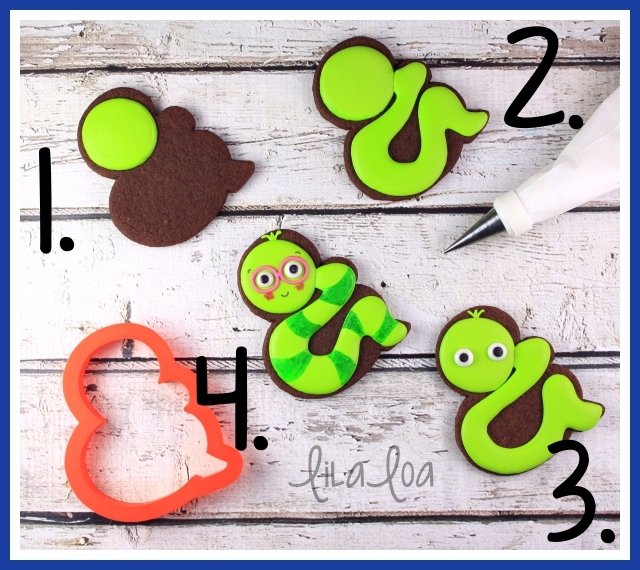 Grab the supplies -- AMPERSAND CUTTER, GREEN AND PINK MARKERS, BLACK MARKER, PRE-MADE EYEBALLS. See how to make the most PERFECT BOW COOKIES ever.